I don't know about everyone else, but I don't really want to look at sugar for awhile. I have been posting so many sweet recipes lately, but the holidays are over- so that means no more sugar or baked goods for a couple of weeks. I am not a person that drinks a green smoothie everyday. We eat enough dark greens here- kale, spinach, swiss chard, turnip greens- almost daily, that I don't feel the need to sneak them into a morning drink. It is a nice healthy way to start the day every so often, though. 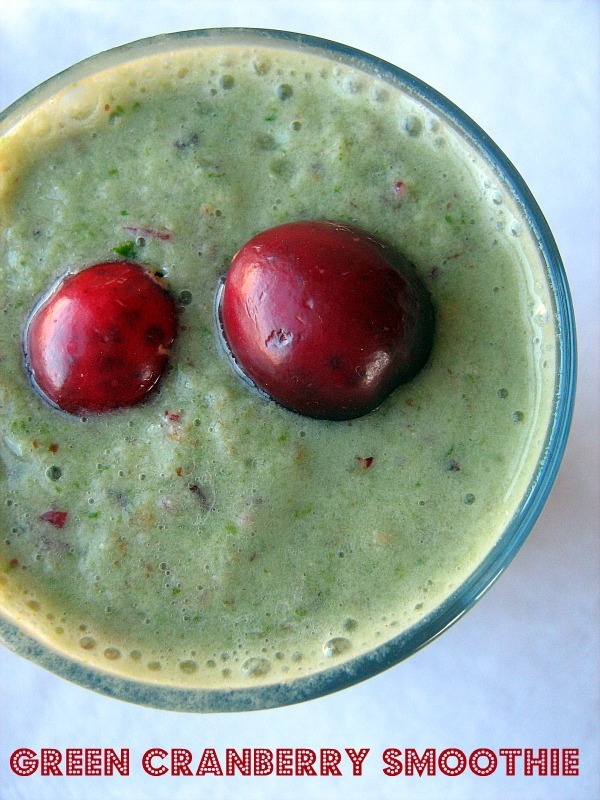 I was curious about using fresh cranberries in a smoothie, so one morning, I whipped this up. It was pretty good. The pear added some interesting texture, which didn't bother me, but I could imagine it might bother someone else. You could sub in berries or some other fruit. 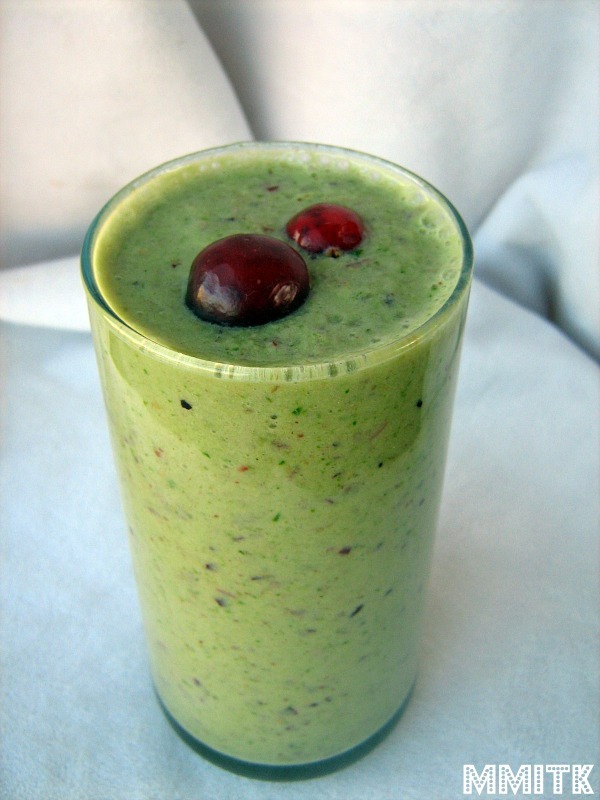 I have to say I love the color of this smoothie, as well as the taste. This week we were able to do a rewind for Tuesday's with Dorie. I went to a dinner party earlier this month and was in charge of dessert, so I decided to make Tarte Noire. This particular tart was chosen back in July by Dharmagirl, who blogs over at bliss: towards a delicious life and you can find the recipe on her blog, HERE. 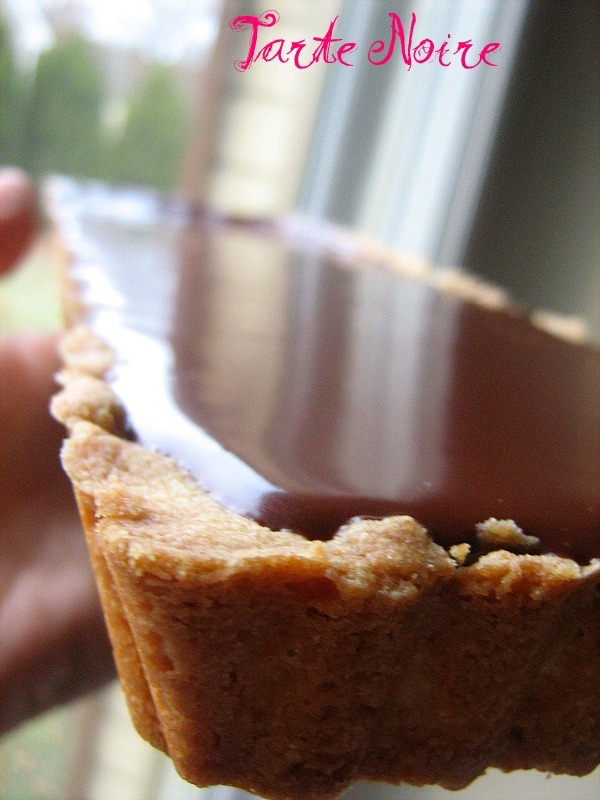 This tart is basically a tart shell filled with chocolate ganache. I used Scharffen Berger- a combination of bittersweet and semi-sweet chocolate. I made this in my rectangular tart pan and also made a fruit tart, filled with this vanilla pastry cream and decorated with kiwis, raspberries, and pomegranate arils. Christmas spirit portrayed in the colors, of course. I wanted to please the chocolate lovers and the fruit lovers too. 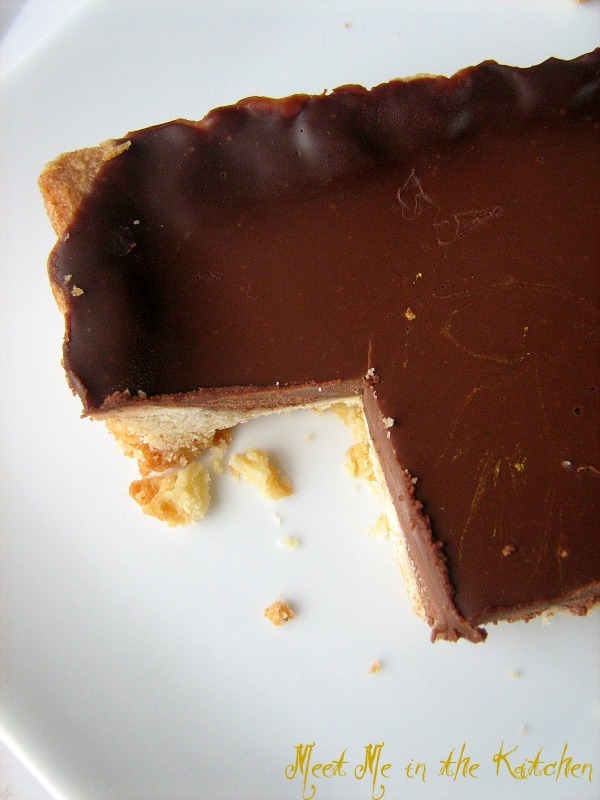 This tart was beautiful and rich. Everyone ate a small piece and enjoyed it. Go over to Tuesdays with Dorie and see what everyone else made for the rewind today! Here is the perfect addition to any holiday party or dinner. These little cheesecakes would also make a perfect gift. I made these a couple weeks ago and took them to one of the first Christmas activities we had in December. We love peppermint bark, but I have only had it homemade. My mom usually makes this recipe, which I usually make also, but this time I decided to try a version that had a dark chocolate layer on the bottom. I found this peppermint bark cheesecake recipe over at Anne Strawberry and coincidently, she made this version when it was her turn to pick for Tuesday's with Dorie, about 2 years ago. 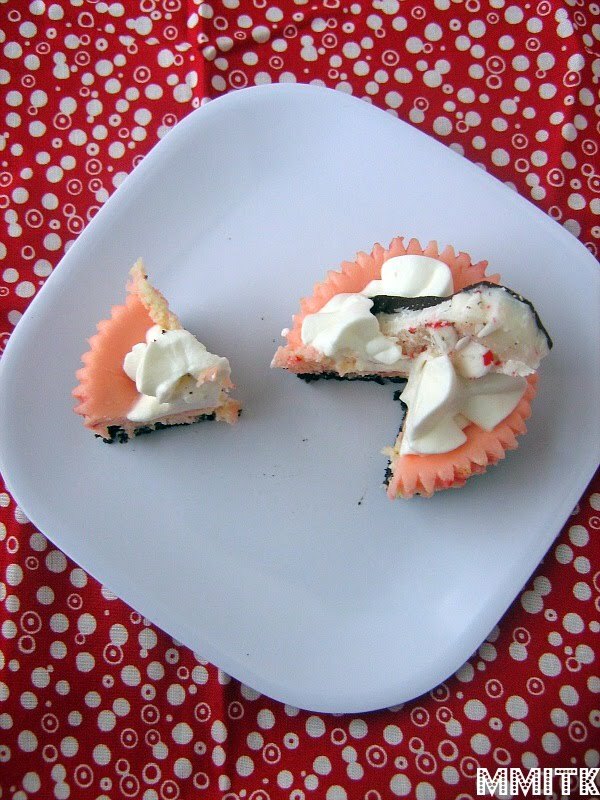 So the base cheesecake recipe is Dorie's, which means it will turn out perfectly. in between the cheesecake layers, slightly sweetened whipped cream and topped off with a piece of homemade peppermint bark. 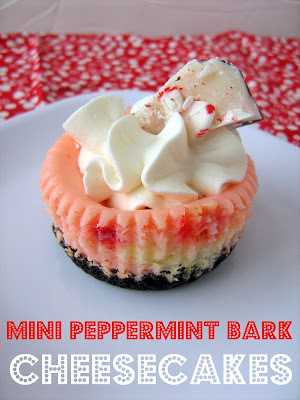 There are a few reasons why I like to make mini cheesecakes. 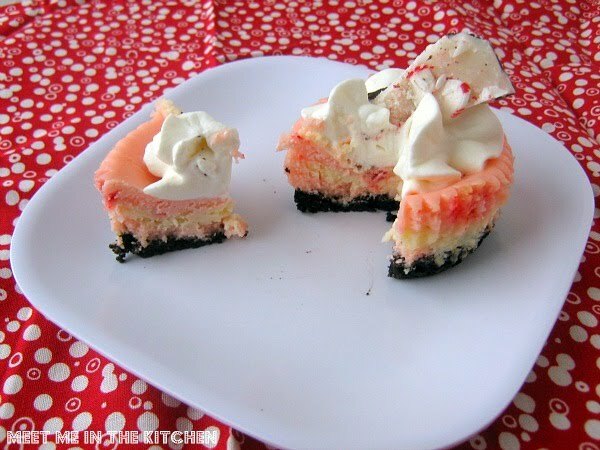 1- They can be made a day ahead and sit in the fridge overnight to chill, 2- almost everyone loves cheesecake, but it is so rich and highly-caloric that you can't enjoy it too often- a smaller serving solves that problem, 3- no worries about waterbaths or tops cracking, 4- they are easy and portable, fun to share and yummy. There are probably more reasons, but those are the ones I can come up at the moment. These were a hit. I loved how they turned out. Merry Christmas! I hope you have a great Holiday weekend! Tuesday's with Dorie is brought to you this week by Jill and you can find the recipe for her choice, Cardamom Crumb Cake, on her blog right here. This is one of the things that has always caught my eye when I have flipped through Baking: from my home to yours. I have always wanted to make it because I love cardamom, but for some reason I haven't made it until today. 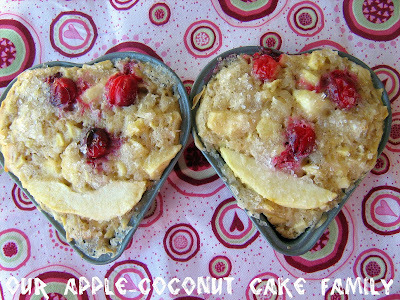 I decided to turn this into muffins, partly because it makes portion control easier and it also makes sharing easier. I subbed low-fat buttermilk for the coffee and the whole milk, so this turned into something that seemed more like a muffin, than a cake. I also added a couple Tablespoons of orange juice to the batter. I omitted the espresso powder from the crumbs. These muffins were good. I thought the walnuts in the crumb topping were the dominant flavor, but the muffin itself had a nice texture and taste. Slightly tangy from the buttermilk and orange, with a nice spice from the cardamom. The full recipe makes 12 muffins. I baked them for 18 minutes and they were done. Go see what the other TWD'er's thought of these recipe and the variations that they made by checking out the leave your link post! I wasn't planning on posting about these 2 recipes that I made for my son's Christmas party at school. I don't post everything single thing that I make and I was just going to make these and let it be. But, my 4-year old had so much fun helping me make these 2 treats that I changed my mind. 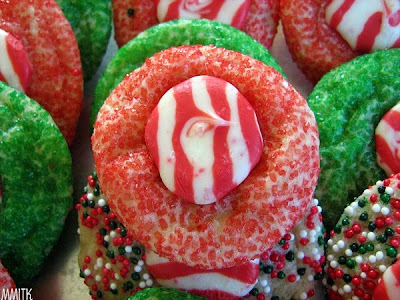 First, we made Candy Cane Kiss Blossoms using Hershey's Candy Cane Kisses. They are based on the same idea as Peanut Butter Blossoms, which are peanut butter cookies with a milk chocolate Hershey's Kiss in the middle. The dough is super easy to mix together and really easy to roll into little balls. 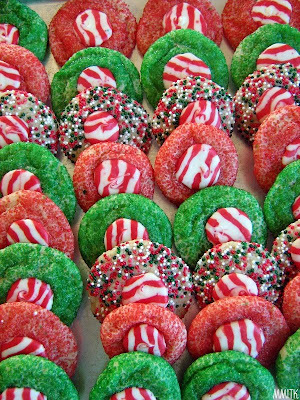 My daughter loved making the little balls of dough and then rolling them in green and red colored sugar. We also rolled some in nonpareils. They bake up in just a few minutes and then you are suppose to let them cool for a few minutes before you put the Candy Cane Kiss in the center. My daughter couldn't wait, since she had helped me unwrap all the Kisses, so we put them in when the cookies were still warm. The melted and so we just got a toothpick and smoothed out the tip and once they had cooled, we put the cookies in the fridge, so the centers could set. Very easy, festive and fun. Then, we made Brownie Buttons. I have made these before and the usual topping is supposed to be white chocolate. 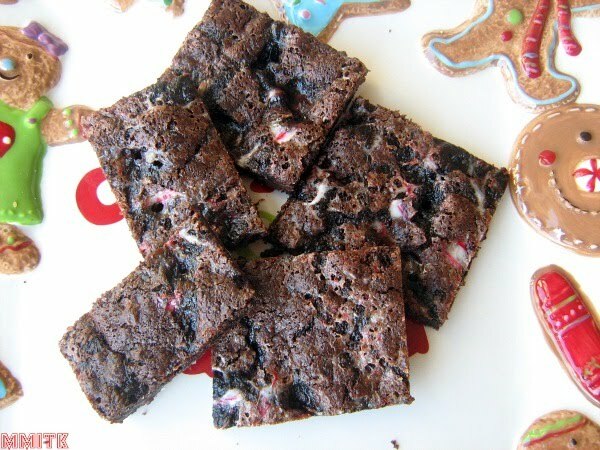 I had a half a bag of Andes Peppermint Crunch Baking Chips in the pantry, so I melted those and we dipped the brownie tops in that. Then we added lots of sprinkles. This topping gave a nice little peppermint-y flavor to the bite-size brownies. The kids in my son's class enjoyed these fun treats. I popped a few of each one in the freezer to save for later this week, so we can put them out for Santa! 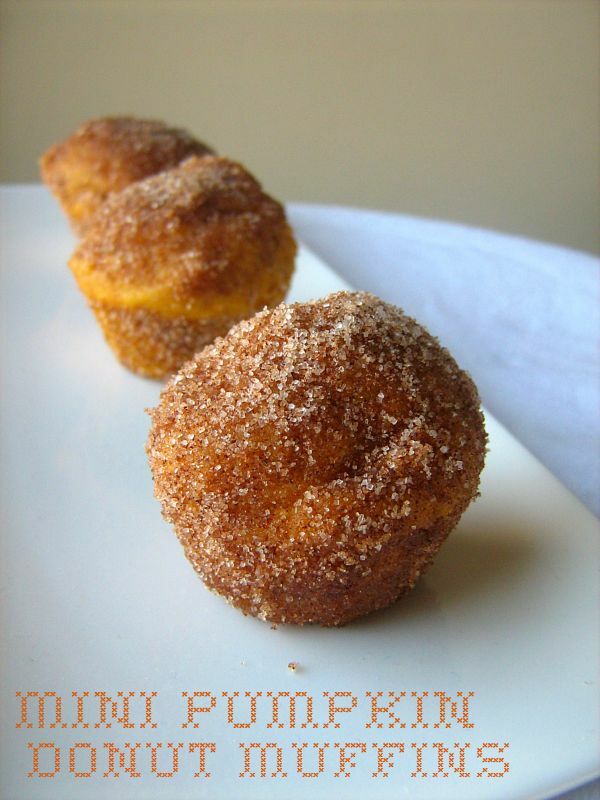 These Pumpkin Donut Muffins have been popping up all over. I saw them in Everyday Food Magazine and definitely wanted to give them a try. The nutrition information was a little bit scary to me for the regular size muffins, but I guess that is where the "donut" part of this recipe got the better of the muffin. My daughter had to bring a snack to school, so I knew that mini muffins would be a great way to have a little something sweet to share with her class. She saw the picture of them and was very excited about having them as the snack. The other kindergarteners were excited too. These mini muffins were a huge success. I sent the rest of the minis with my husband to work and they were enjoyed by everyone. I sampled one and they were really delicious. These could be dessert of breakfast. You decide. The perfect little goodie for the holidays! * I used half the amount of melted butter called for for the tops of the muffins. 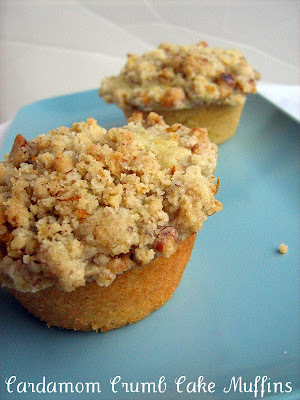 I dipped the top of each mini muffin in the melted butter and then put the mini muffins in the cinnamon-sugar topping. Because the mini muffins were warm, some of the cinnamon-sugar topping stuck to the parts of the muffin that had not been dipped in melted butter. These are the cookies that I made and sent in the mail to some family members. When I am making a bunch of treats at the same time, I always try to choose a variety of flavors and textures. 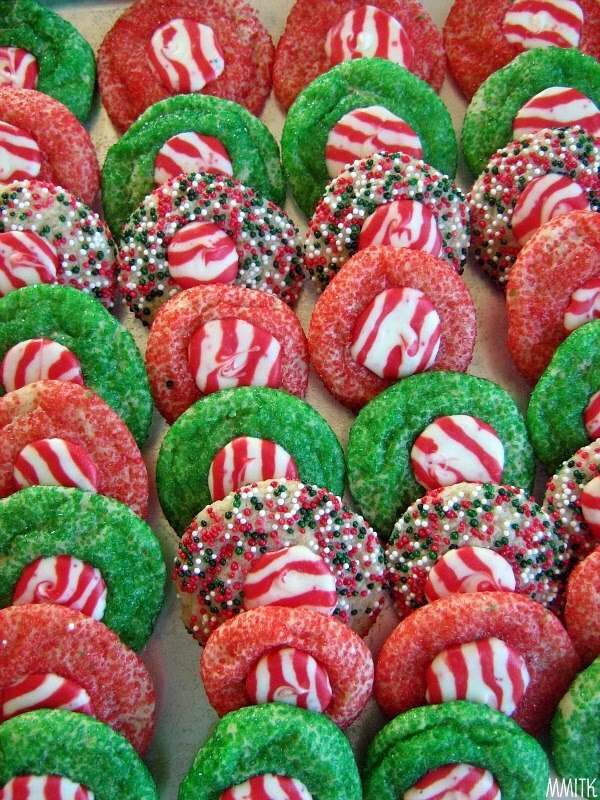 Since it is Christmas time, I made sure to choose some cookies that had appropriate flavors for this time of year. Ginger, pumpkin, peppermint, cranberries, etc. I recently received a copy of The Gourmet Cookie Book, a cookbook in which the best cookie from the pages of Gourmet magazine was chosen for each year, from 1941-2009. I thumbed through this book and chose a couple of recipes to try. The ginger sugar cookies stuck out to me because my family loves ginger and they looked like a chewy, delicious cookie. They smelled yummy and my kids each sampled one. My 4 year old thought they were too spicy, but my other kids loved them. 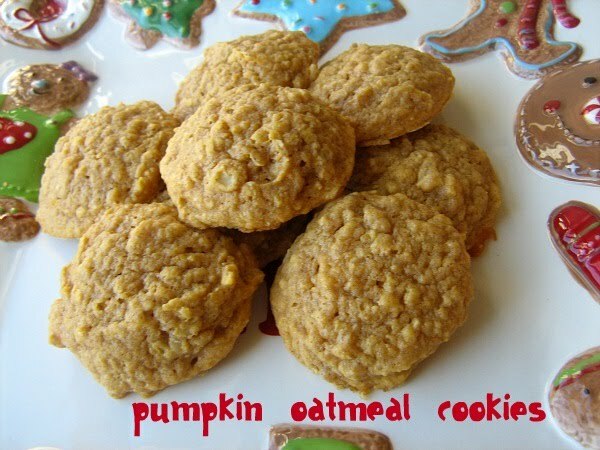 These pumpkin oatmeal cookies look ordinary enough, but boy are they tasty. I was curious about their flavor, so I ate one. These were sooo good. 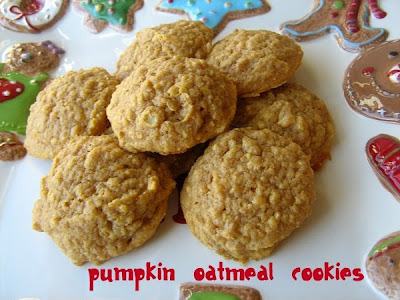 Usually it seems like oatmeal cookies have all sorts of add-ins, like raisins, or nuts or chocolate chips, but these were so yummy because the stars of the show were just the pumpkin/spices and oatmeal. 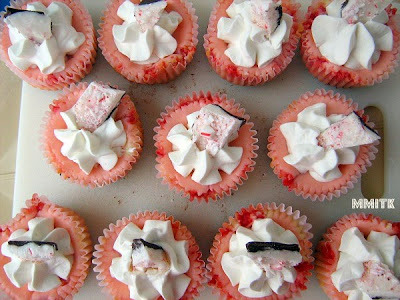 I will definitely make these again and again. 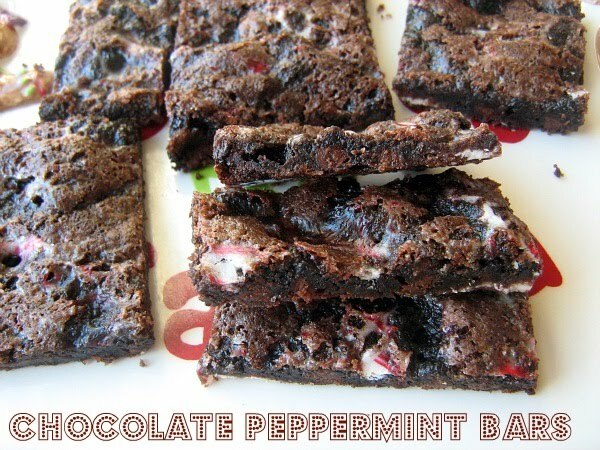 These chocolate peppermint bars were described by my son as "brownies with candy cane flavor". I didn't try one, but my son really didn't want me to send these in the mail. The batter was hard to spread, but it evened out in the oven. Not very pretty, but good to eat. 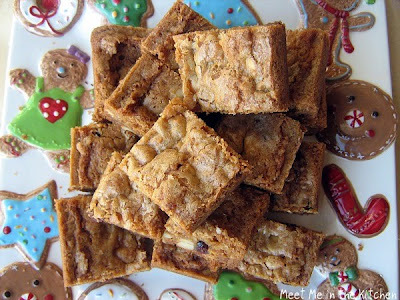 The last cookie I made is a classic bar cookie that always gets great reviews- Dorie's Chewy, Chunky Blondies. I have made these multiple times before and they are always a crowd pleaser. Usually they are chock full of nuts, chocolate, toffee bits, coconut-basically whatever you want to add. This time I decided to add in some holiday flavors, so I went with dried cranberries, white chocolate chips, chopped macadamia nuts and toasted coconut. These bars are perfect for sharing. 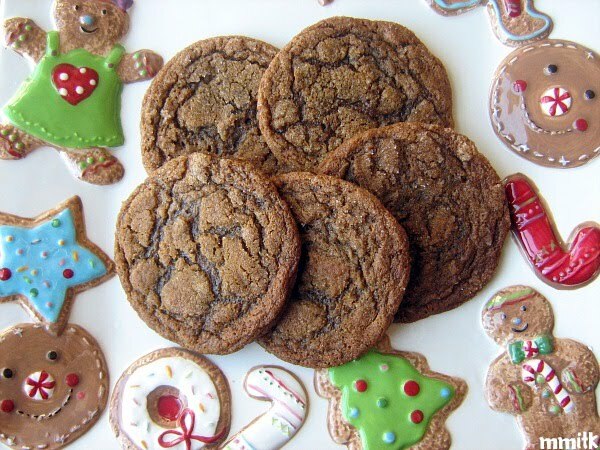 Cream 3/4 cup softened butter and gradually beat in 1 cup dark brown sugar, firmly packed. 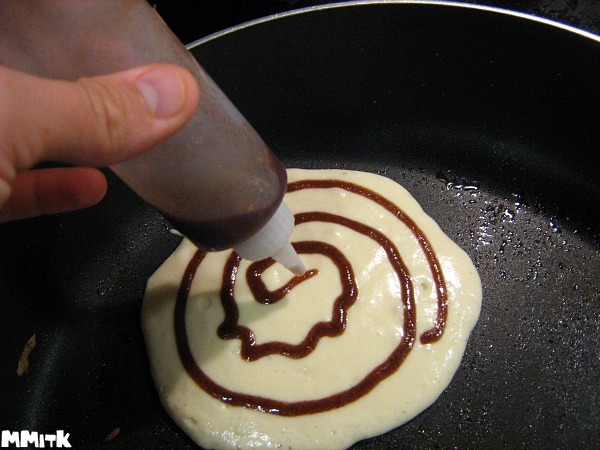 Stir in 1 egg and 1/4 cup molasses and blend thoroughly. 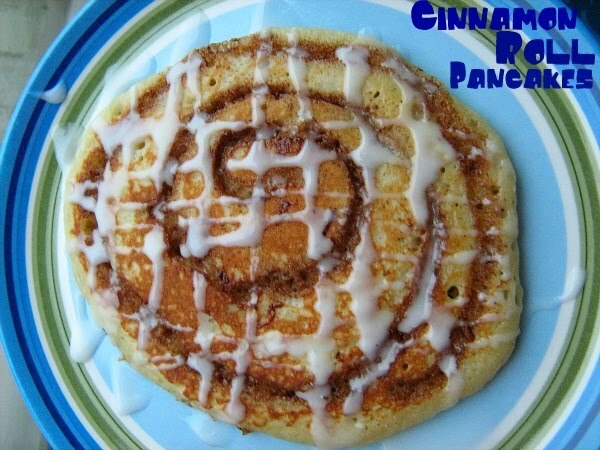 Sift 2 1/4 cups flour with 2 tsp baking powder, 1 tsp each of cinnamon and ginger, 1/2 tsp cloves, and 1/4 tsp salt. Gradually blend the dry ingredients into the creamed mixture and chill the dough for 1 hour. 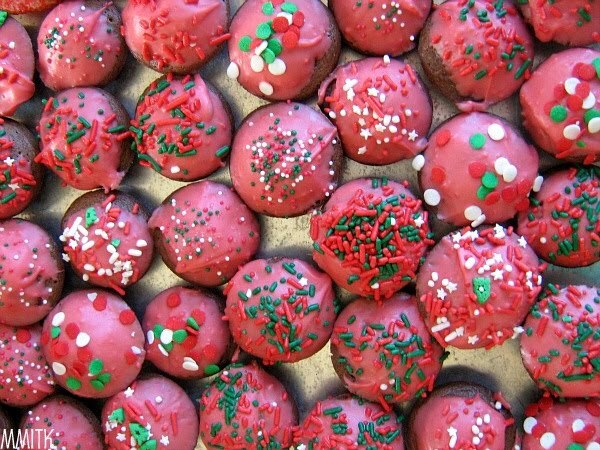 Drop by heaping teaspoons into 1-inch balls and dip the tops in sugar. Arrange the balls at least 3 inches apart on a greased baking sheet and sprinkle each cookie with 2 or 3 drops or water. Bake the cookies at 375 degrees for about 7 or 8 minutes, or until they are firm. Working with a stand mixer, preferably fitted with a paddle attachment, or with a hand mixer in a large bowl, beat the butter on medium speed until smooth and creamy. Add both sugars and beat for another 3 minutes, or until well incorporated. Add the eggs one by one, beating for 1 minute after each addition, then beat in the vanilla. Reduce the mixer speed to low and add the dry ingredients, mixing just until they disappear into the batter. Using a rubber spatula, stir in the chips, cranberries, nuts, and coconut. Scrape the batter into the buttered pan and use the spatula to even the top as best you can. Bake for about 40 minutes, or until a knife inserted into the center of the blondies comes out clean. (I usually have to keep adding 5 minutes at a time, until they are done- don't be afraid to let them cook a little longer). The blondies should pull away from the sides of the pan a little and the top should be a nice honey brown. Transfer the pan to a rack and cool for about 15 minutes before turning the blondies out onto another rack. Invert onto a rack and cool the blondies to room temperature right side up. 1. Preheat the oven to 350 degrees F (175 degrees C). Line two baking pans with parchment paper or a silicone mat. In a medium bowl, mix the flour, oats, baking powder, cinnamon and salt. 2. In the bowl of a stand mixer fitted with the paddle attachment (or a large bowl with a hand mixer), beat the butter and both sugars until fluffy, about one minute. Add the egg, beating until incorporated, then mix in the vanilla and pumpkin. With the mixer on the lowest speed, add the flour mixture, mixing until just incorporated. 3. Drop heaping teaspoons of dough onto the prepared baking pans. Bake 12 to 15 minutes or until lightly browned around edges. Let the cookies cool slightly on the pans before transferring to wire racks to cool completely. My daughter and I just made this delicious cake. Amber chose it for this week's Tuesday's with Dorie recipe and you can find the recipe on her blog HERE. We made this as an after-school snack, mostly because I had some leftover coconut milk in the fridge and I figured I could use the coconut milk in place of the yogurt. I also used applesauce instead of the oil. 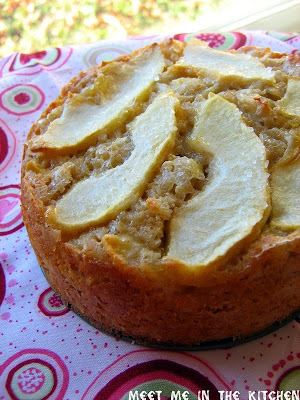 I reduced the sugar by about 1/4 cup since I only had sweetened coconut to use in the cake. I wasn't sure what to expect. 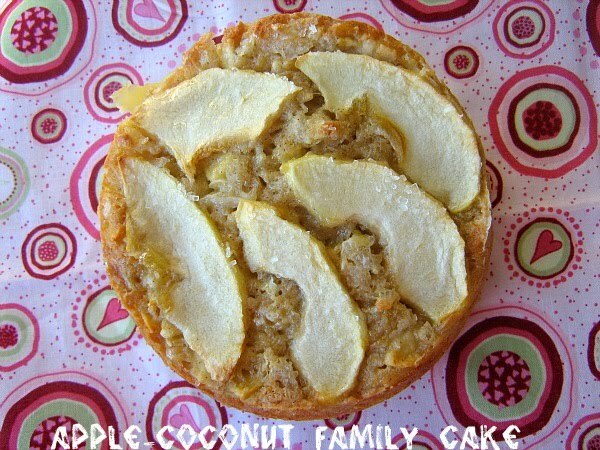 I haven't ever combined apple and coconut in anything, but it worked out really well. The coconut milk really brought out the coconut flavor and the apples were delicious. I skipped the glaze and just sprinkled my cakes with sanding sugar. I doubled the recipe, since I had a full cup of leftover coconut milk. I made 2 6-inch springforms, 4 4-inch springforms, and 5 little heart cakes. My daughter wanted to make faces on the heart cakes- one for each member of our family. She used cranberries for the eyes and an apple slice for the mouth. Not too bad for a 4-year old. You can see everyone else who participated this week by checking out Tuesday's with Dorie! This is a cookie that would be the perfect gift for any chocolate lovers in your life. A couple of weeks ago, I needed to make a treat for a Cub Scout meeting and so I wanted something quick and easy. 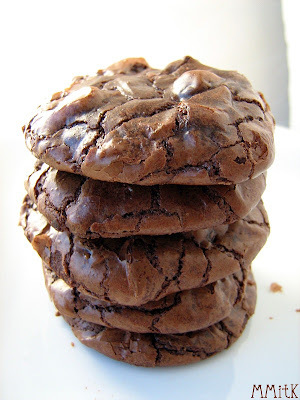 My son loves brownies and I remembered seeing these cookies over on Tracey's blog. They were the perfect treat. 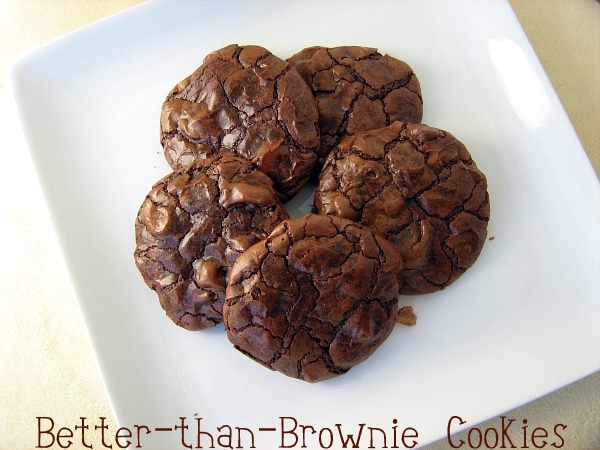 They look like a cookie, but they are gooey and chocolate-y in the middle. Someone commented that they tasted like melted chocolate. Funny, because that is basically what they are, with a few other ingredients thrown in the mix. If you aren't a fan of dark chocolate, you could probably use semi-sweet and get great results. These ones disappeared in a hurry! 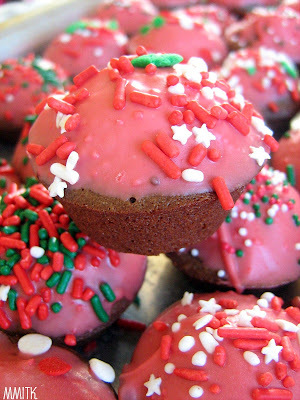 Let the festive baking and giving of baked goods begin- or continue, if you have already begun doing so. 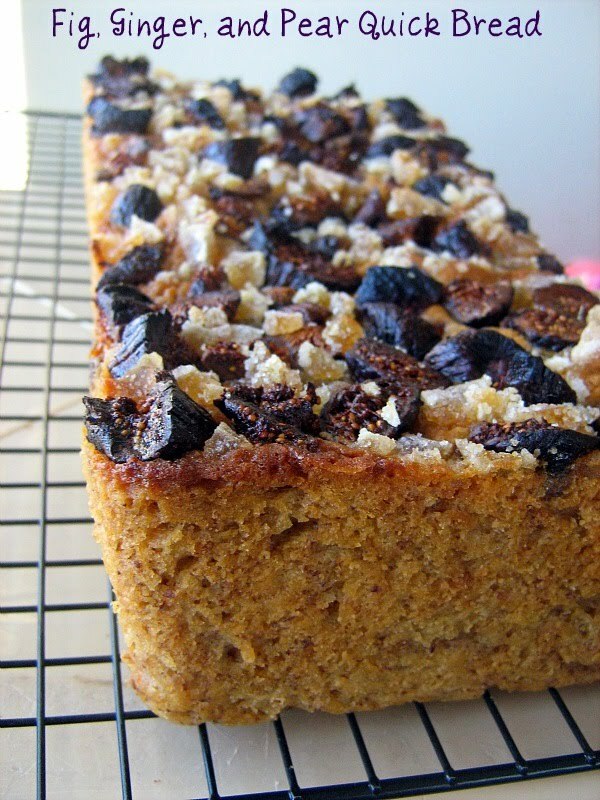 I made a bunch of cookies and this quick bread and sent it off in the mail to some family and friends. I chose this bread because it specifically stated that it should be baked, wrapped in plastic and saved for the next day. So, I figured that if I shipped it quickly to someone in another state, an extra day would make it that much better. This bread contains shredded fresh pears, which I have never used in a baked good before. The keeps the batter nice and moist and I'm sure adds great flavor. 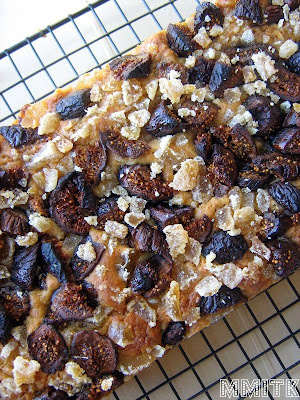 This bread is topped with dried figs and crystallized ginger. It smelled so good. I really wanted to cut a slice and give it a taste, but who wants to receive a half-eaten goodie in the mail? I will just have to make another batch into mini-loaves, so I can try it for myself. It's been awhile since I talked about risotto. I saw this recipe in a recent issue of EveryDay Food magazine and thought it would be fun to try since it is not a traditional way to cook risotto. The risotto is started off on the stove top, but then finishes cooking in the oven. It kind of kills the notion that to get that creamy beautiful texture you have to spend forever stirring away. I already knew that you don't have to stir risotto the whole time. So, I started this off in my saute pan and transferred it to a 9*13-inch glass dish to finish it in the oven. I was a little skeptical when I put it in the oven, as to whether or not it would still have that creamy texture. While the rice on the very top was a little bit drier than that on the bottom of the dish, the overall texture was very nice and risotto-ish. 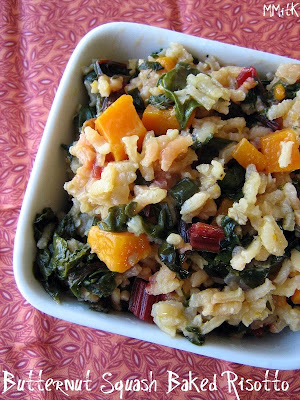 This was a great recipe and a fun take on the classic preparation of risotto. I would make it again in a heartbeat. And I just want to say that whoever said risotto doesn't taste good re-warmed is very wrong. These leftovers are good cold, slightly warm and hot. There are so many delightful holiday flavors and I love almost all of them. One of my favorites right now is Peppermint. I made a Cooking Light version of Peppermint Ice Cream last year, and while it was pretty good for a lighter choice, with ice cream, I think that the real, full fat version produces better results. 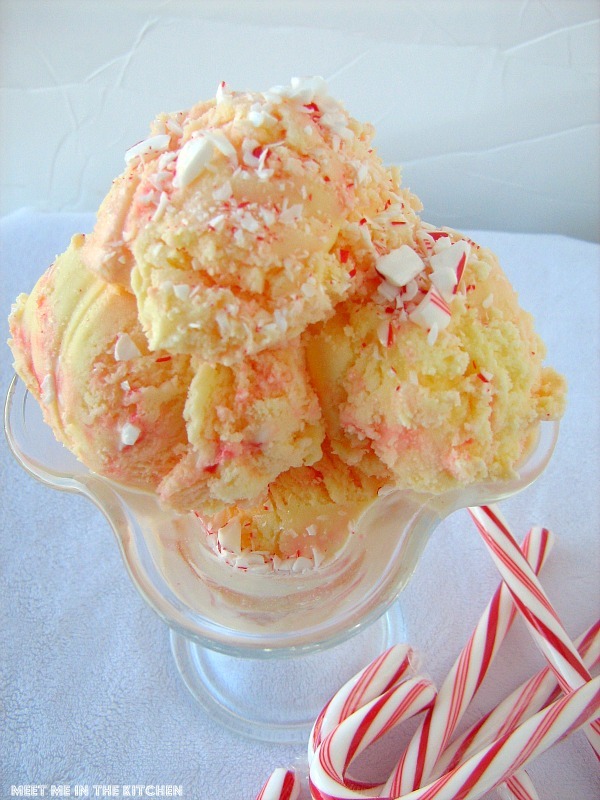 My family definitely agreed with me on that when I made this ice cream. This recipe came from Simply Recipes, which happens to be the place where I found one of our favorite ice cream recipes earlier this year-Mint Chocolate Chip. I happened to have 8 egg yolks in my fridge, leftover from my daughters birthday cake, so this recipe was the perfect way to use them. 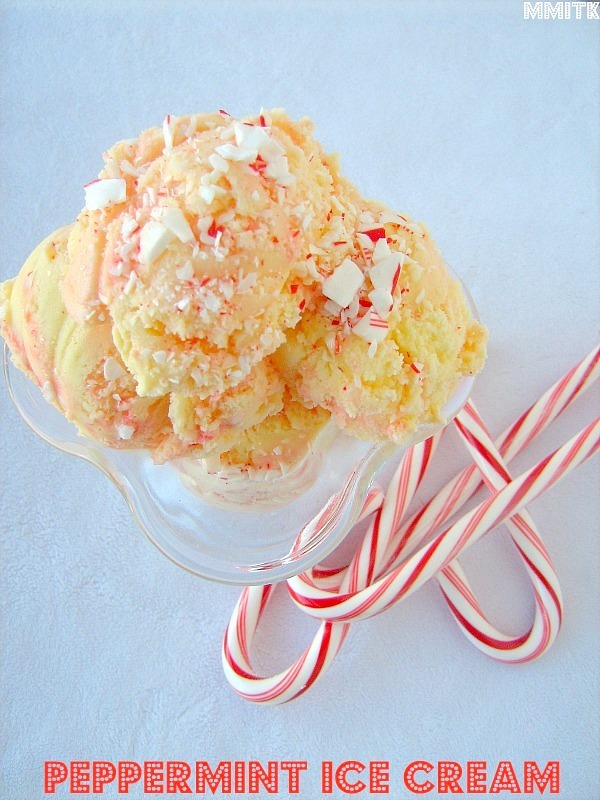 This ice cream was silky, smooth and perfectly peppermint-y. My husband loved it. He ate most of it. And whenever he loves the ice cream I make, I consider it a huge success. This ice cream was so creamy and delicious. 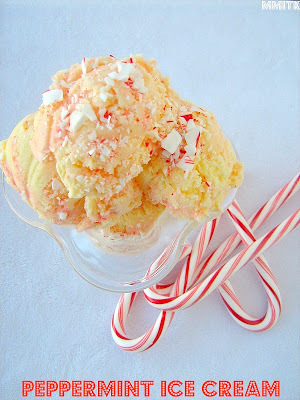 The perfect peppermint treat! Here is a fun way to use cranberries, in a delicious salsa. 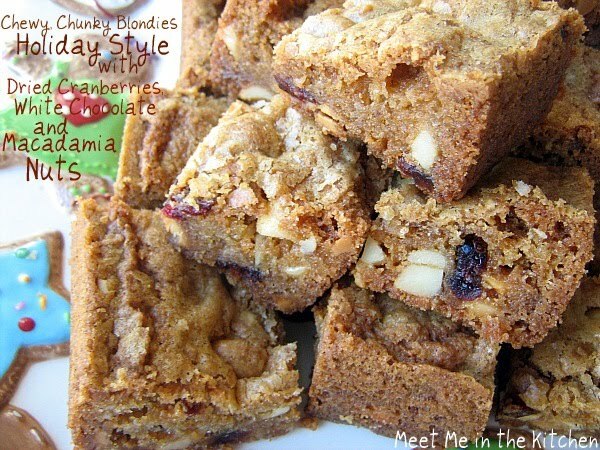 I love cranberries and finding savory ways to enjoy them is really great. I took this salsa to a Christmas get-together and it was gone by the end of the night. 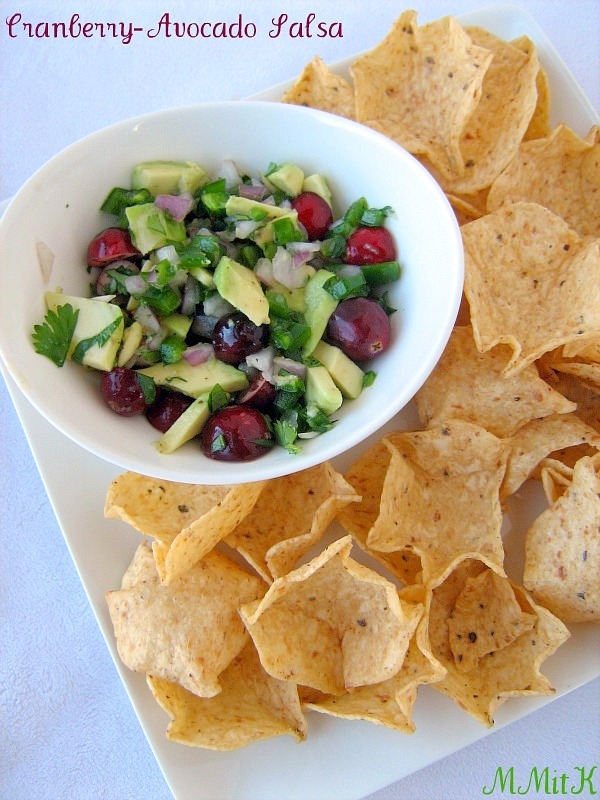 There is a little bit of honey and lime juice, which evens out the tartness of the fresh cranberries. If you need a fun appetizer for a party or just want to try something a little different, give this a try!